Some say hot dogs at New Way Lunch, and others say Dirt Dogs at Dirty John's. No matter what you call them, their smell and taste - a hot dog topped with mustard, diced onion, and a special meat sauce - is truly one-of-a-kind. Here in Glens Falls, these world-famous hot dogs have been served since 1919! The name New Way Lunch is the eatery's official name. However, there have been many nicknames for both the hot dogs and the business over the past few generations. During its early years, New Way Lunch's original owner was John Floro. He owned and operated the eatery for over 20 years, and during that time, locals called the place John The Hot Dogs, Hot Dog John's, or John The Hots. After John Floro passed away in 1950, the nicknames for New Way Lunch began to change (but still referenced John's name). Around the 1960s, Dirty John's and their Dirt Dogs became the new nickname for the business and the hot dogs. Today, depending on how you were introduced to the local hot dog eatery, you might call it Dirty John's, Hot Dog John's, or just New Way Lunch. It's up to you! John Floro, the original owner, moved from Greece to New York City in 1916 and worked at a fruit stand in Brooklyn with his brothers. Floro married Mary Lascaris and had three daughters with her during his short stay in New York City. In 1919, Floro realized he could no longer run the fruit stand with his brothers, and he decided to look for a new job elsewhere. In August of that year, he traveled to Glens Falls and would become the owner of New Way Lunch at 54 South Street. From the early 1920s-1940s, New Way Lunch grew as a family run business, with many Floro clan members and friends working there as employees. While in Glens Falls, John and Mary had two more daughters, which made five in total: Constance, Margaret, Diamond, Angela, and Themetria. 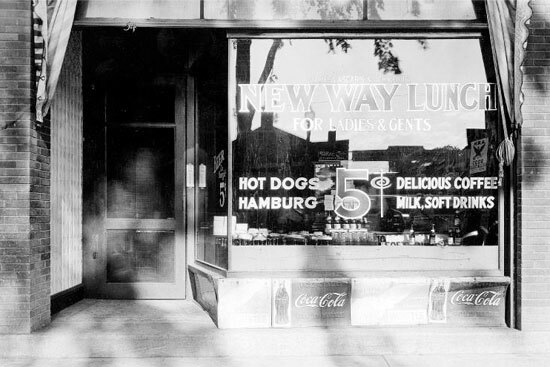 At its original site on South Street, New Way Lunch was open 24 hours a day 7 days a week, making it the perfect place for blue-collar workers and the rest of the community to stop by for hot dogs any time they wanted. The only time the eatery closed was when Franklin D. Roosevelt died, and the government required all businesses to close for his funeral. When John Floro passed away in 1950, his daughter Margaret's husband, George Kokoletsos, became the new majority owner. Kokoletsos operated New Way Lunch from 1950-1972, and then he retired from the business. After Kokoletsos retired, New Way Lunch was still owned and operated by other members of the family. In the late 1970s, Peter Gazetos, the son of John Floro's daughter Angela, started to help out at the eatery. By 1990, he had become the newest owner of New Way Lunch. In 1998, Gazetos and his wife Susan opened a second New Way Lunch in Queensbury, which includes a drive-through and off-street parking. Then, in 2006, the couple moved the original New Way Lunch from 54 South Street to 21 South Street. This move allowed them to offer off-street parking and expanded menu selections in Glens Falls. The third New Way Lunch opened in Warrensburg in 2011 thanks to help from the couple's children. Now, New Way Lunch is in three different Glens Falls Region locations, making it even easier to try the world-famous Dirt Dogs. Gazetos and other members of the family continue to operate New Way Lunch as John Floro once did.